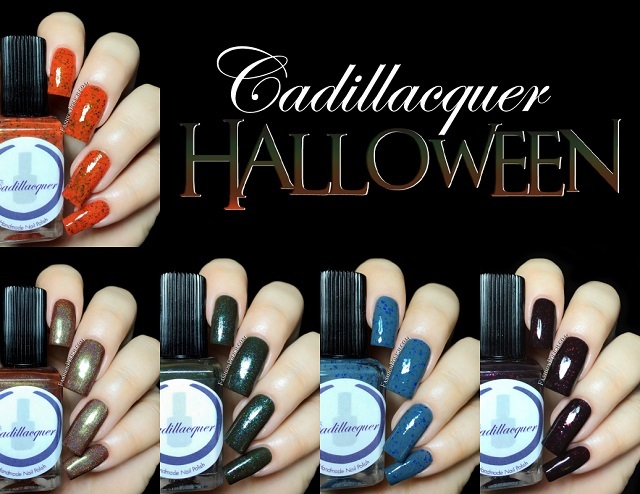 Fashion Polish: Cadillacquer Halloween 2014 collection swatches and review! 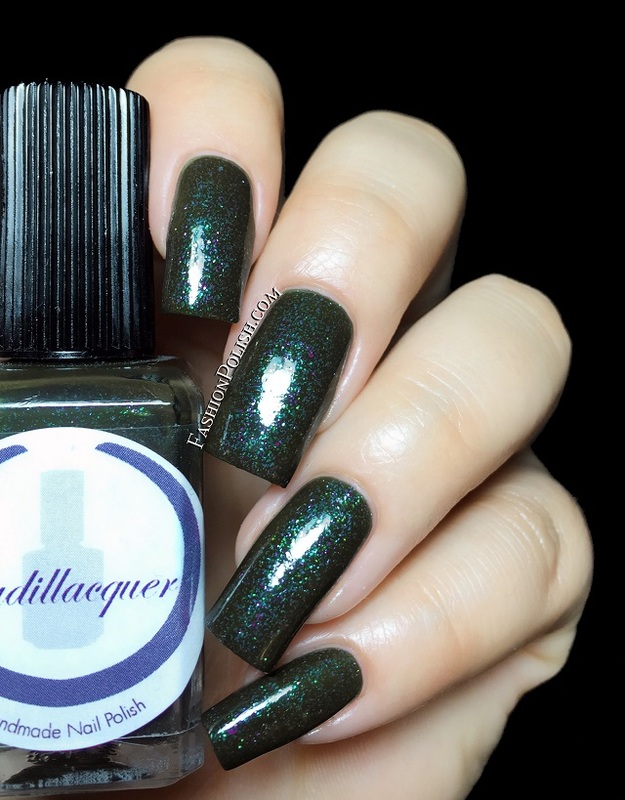 Cadillacquer Halloween 2014 collection swatches and review! Hi guys! Halloween collections have started popping up and I couldn't be happier! I don't know about you but Fall has got to be one of my favorite seasons polish-wise and I have to say that Halloween releases are something I'm very much looking forward to. So today I have the Cadillacquers Halloween 2014! Formula was top notch on the entire collection, they all applied like a dream and required 2 coats for complete coverage, no fishing for the glitters. It’s In Here With Us is a bright orange jelly with shiny forest green glitter pieces. It screams Halloween to me, it felt like pumpkin on my fingertips. Game Over is a brown ocher linear holo with a strong gold to green shimmer flash. It's a very unusual color but it looks great, perfect for the season. Please Don’t Kill Me, Mr. Ghostface is a greyed out blue jelly with a mix of different sizes of blue glitters and added shimmer. This one reminds me why I fell in love with Cadillacquer in the first place, somewhat similar to the brand's earliest releases, it feels like a "back to basics" type of color. When You’re In Hell, Only The Devil Can Help You Out is a dark olive green jelly packed with tiny green, pink and purple flakies. Another unique color that totally makes sense in a Halloween collection. You’ve Got Red On You is a vampy burgundy jelly with metallic red glitters and pink/purple shimmer. I was sold at vampy... Love it! The Cadillacquer Halloween collection is available for purchase on cadillacquer.com and retails for $12 to $12.50 each or $54 for the full set. Cadillacquer is also available through various stockists worldwide (full list here). So what do you think about these? Are you as excited about Halloween collections as I am?